UPDATE: “Clinton Cash” is now the #1 Facebook trending topic — screenshot has been updated. 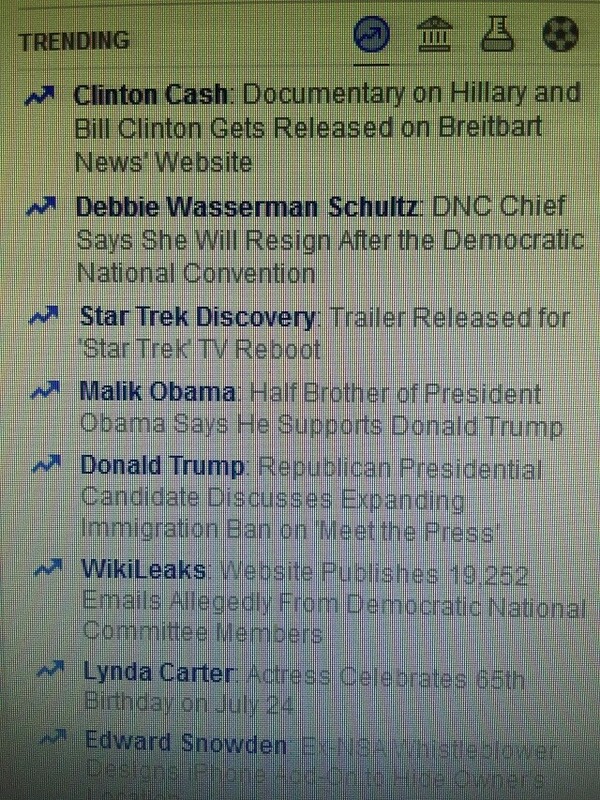 Clinton Cash catapulted to the #2 trending topic on Facebook Sunday, in the wake of the global premiere of the motion picture adaptation of the New York Times best-selling book Clinton Cash authored by Government Accountability Institute President and Breitbart Senior Editor-at-Large Peter Schweizer. Among the most impassioned supporters of the film were committed Bernie Sanders backers, who took to their respective Facebook accounts and prompted to them film to their followers. Among them were: Veterans for Bernie Sanders, which boasts 50,889 Facebook followers; Jill Stein–Rockin’ in the Green World and Bernie Sanders for President 2016 which tout 47,079 and 116,922 Facebook followers, respectively; and Bernie Sanders is My Hero which has 68,763 Facebook followers. In all, more than 283,000 dyed-in-the-wool Bernie Sanders supporters helped push Clinton Cash to the top of Facebook’s trending topics list. As Breitbart News previously reported, more than 170,000 viewers, in just the first three hours, tuned in to watch the global premiere of Clinton Cash. Following the film’s world premiere, reaction to Clinton Cash on social media was relentless. The 105-minute film was directed by M.A. Taylor and produced by Breitbart News Executive Chairman Stephen K. Bannon. Clinton Cash the movie exposes the disturbing pattern of record-high speaking fees to Bill Clinton and donations to the Clinton Foundation from foreign contributors, which conspicuously coincided with favors for Clinton cronies and foundation donors while Hillary Clinton was secretary of state. The Clinton Cash movie will air again on Sunday, July 24 at 2:00 pm (EST) and again at 8:00 pm (EST).